I am so lucky to encounter such sweet people in my life! Last night when I went to my quilt class a fellow classmate gave me a disc for beginners quilting. How sweet!!! She told me that I could sit with her and her friends next week and that the women at my table are "not young enough" for me to sit with (they are in their fifties/sixties)! Hahha! Last week in class I was speaking to a lady named Kris who is a nurse. I talked a little bit about my mom who is a nurse too. 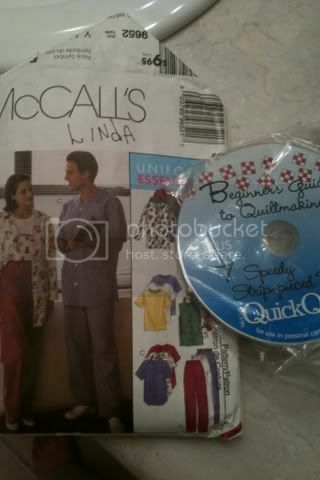 Yesterday she brought me a pattern for scrubs so I can make my mom some stylish work gear! So sweet!! !